Located approx 15 mins from both the heart of historic downtown Beaufort, SC and from the beaches of Hunting Island, this nearly 2,000 htd/cld sqft, 4 bedroom/2 bath home includes approx. 11 acres and offers a rare sense of seclusion and privacy. 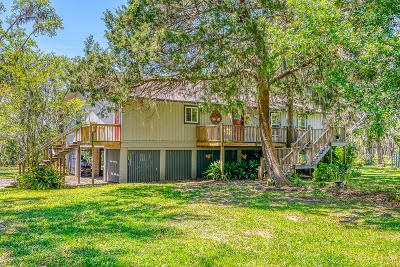 This exceptional property was remodeled in 2018 and offers spectacular marsh views, multiple mature live oaks & palmetto trees, a stocked pond, fireplace w/custom driftwood mantle, large picture window overlooking the marsh, new carpet, new hardwood flooring, new kitchen w/butcher block countertops, stainless appliances and farm sink, a spacious 12 x 36 rear deck on the back of the home, a $6,000 roof allowance + much more. Ask Agent for the complete list of features! Purchase includes add'l parcel #R300 016 000 0466 0000 & R300 016 000 0467 0000.